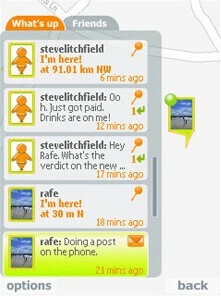 Those that enjoy keeping others updated on their location will find Nokia's 'Friend View' an application of interest. The software offers a combination of blogging and location-based services, allowing the user to communicate their thoughts as well as their location. Not only can the blogger keep their status updated over the phone; they can also update their information through a web interface, accessible from any web-based computer. The tutorial makes it known that the application is a beta, and though it may not be completely ready for commercial launch, it is certainly functional. So, the next time a friend calls about coffee, be sure to use Friend View - it will redefine the old phrase "meeting in the middle." dis boy is from romania , best people.